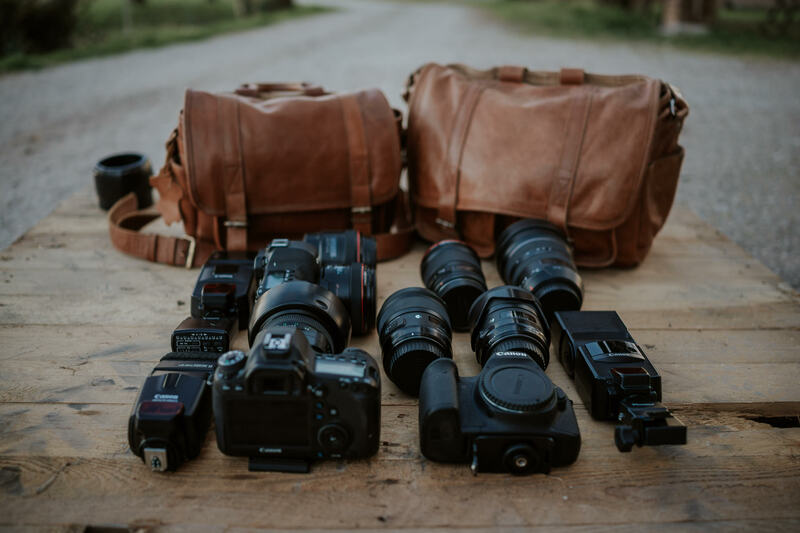 Sometimes, our customers and our colleagues wedding photographers ask us what kind of photographic equipment (cameras and lenses) we use to shoot our wedding services. 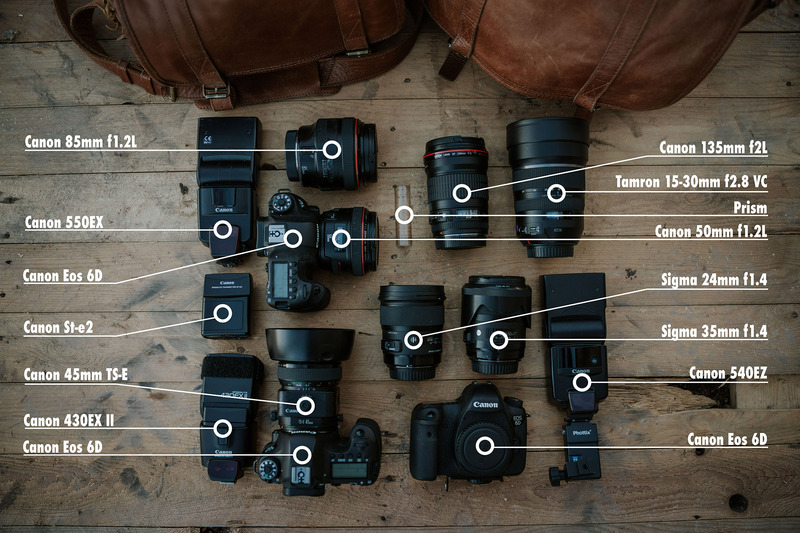 So we decided to open our camera bags for you, to show our “tools of the trade”, although we are aware that the most important tools are the eye and the experience of the photographer. Here is what we have chosen for our work. We started taking our wedding services with the “old” Canon 5d mark II and, despite the exit of the 5d mark III, we decided to focus on her “younger sister” 6d because, after various tests, we considered it more suited to our needs. In fact, this camera allows you to have better results in low light conditions and has a higher dynamic range. We have 4 Canon 6d, 2 each. We decided to opt for fixed lenses (excluding Tamron 15-30mm) because they are brighter and allow us, in most occasions, to leave the flash home. They have a much more pleasant bokeh and depth of field which allow you to focus all your attention on the subject. One of our favorite objectives! Fast, light and amazing. It fits perfectly to all situations, if we were obliged to shoot all the wedding with only one lense it would be our choice. We always use it: during the preparations, the ceremony, the couple portraits and the party. We love this lens! it is perfect for portraits and can give an enchanting bokeh. It gives the photos a special magic. Many have tried to imitate him, but so far no one has ever succeeded. Compact, lightweight, fast and capable of superb performances. It’ s very easy to fall in love with this lens. We use it both during the couple portraits and during the ceremonies that take place in large spaces. It is not suitable for photos at night or in low light conditions. We recently introduced it in place of Canon 24mm f1.4L and we do not regret the choice. Suitable for portraits with huge landscapes (to amplify the dramatic effect) or in very small places (to make the spaces look larger). We use it especially during the preparations and during the dances. Another great lens of the ART series, it’s perfectly suited to any situation, ideal for reportage style and, combined with a 85mm, covers the 99% of the service. It’s another multipurpose lens (a bit’ as the 50mm). We use it almost always. It’s perhaps the most eccentric lens we have. It is a decentred lens that creates original and creative effects. We use it sparingly during the portrait session, to give a special touch just to a few clicks. The only zoom inside our kit, a super wide-angle lens that we use for photographing large location or to give an “epic” tone in some portraits. During the day, we don’t take more than 5-6 pictures with this lens; however, it remains important to give completeness to the service. Abstract: we do not love flashes. Our very bright lenses enable us to avoid them in 99.9% of cases. However, we have included them in the kit to be ready for any situation. It’s a flash transmitter. The few times we use the flashes we like to place them in the room, rather than mounting them directly on the camera. On these occasions it becomes essential the transmitter. Prism can be used, without exaggeration, to create optical effects. It becomes useful during the preparation of the bride and during the couple session. We use two vintage style camera bags (one small and one larger) by Paul Marius, in genuine leather. We find them very stylish and comfortable.